The atmosphere and decor have always been a big hit, but I’ve never actually eaten at Bungalows and Bears. So, when I spotted that they’d had launched a 2-for-1 deal on gourmet burgers every Tuesday evening, it was all the motivation I needed: it was straight from the office to 50 Division Street, with double-cooked chips and burgers in mind. Bungalows and Bears’ burger menu puts other pedallers of gourmet burgers to shame. It’s split into three sections – beef, chicken and vegetarian. While the chicken section is restricted to just two burgers, beef-lovers can top their meat with everything from chorizo and grilled halloumi, to smoked bacon, goat’s cheese, and avocado. With three (!) equally impressive veggie options on offer, I had a tough call to make. After much soul searching, I decided to save the Shroomaloomi burger (flat mushrooms and grilled halloumi) for another day, and went all out on the Hippy Deluxe (£8.55) which came topped with field mushrooms and emmental. At the other end of the table, it was a similiar no-holds-barred burger-fest of beef topped with avocado, blue cheese and bacon. At nearly £9 per burger, Bungalows and Bears isn’t cheap, especially if you like a tipple with your food. However, building on our 2-for-1 savviness, we ordered a bottle of reasonably-priced Chardonnay (£9.95) that lasted the entire meal. The wine arrived extravagantly presented, in an enormous bucket packed with ice, alongside our cutlery and a wire wrack containing an impressive array of sauces. I’m a bit of a chilli head, so I was excited to spy three hot sauces mixed in with the usual mayo, mustard and ketchup: standard Tobasco, a green jalapeno sauce and a chipotle version. So far, so good, but when our just-shy-of-nine-quid burgers rolled up, my confidence was shaken. They were served in plastic baskets and, even at a glance, I could tell both burgers were super-greasy. Confidence was restored when I took my first bite – sure, the burger didn’t look as appetizing as I’d expected, and okay, it was one of the messiest, greasiest burgers I’ve eaten recently, but it tasted fantastic. The patty itself was a satisfying mix of nicely-cooked lentils and tasty mushrooms, topped with tangy cheese. Experimenting with some of the hot sauces sealed the deal. 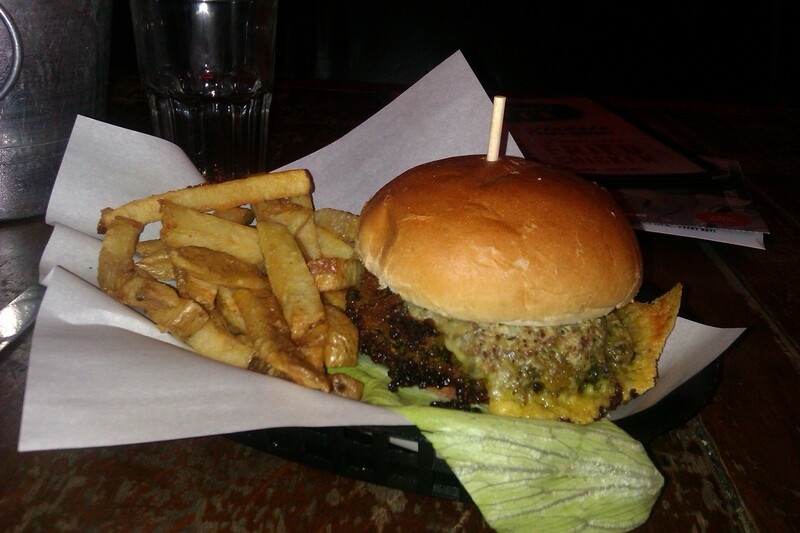 If you order a veggie burger at Bungalows and Bears, be sure to slather it in Tabasco! The burger came with a very generous portion of double-cooked chips, a few of which had scraps of crispy skin still on. Personally, I prefer my chips a bit chunkier, but they were delicious nonetheless. At the other end of the table, the beef burger was similarly messy (this certainly isn’t first date food!) but again it delivered where it matters: the taste. Despite being a little dubious to begin with, it turns out that a thick wedge of melt-in-the-mouth avocado, salty bacon and super-strong cheese is a match made in heaven. Again, the burger came with a mountain of double-cooked chips. Combined with the thick meat patty, filling avocado and lashings of blue cheese, this belly-buster was impossible to finish. Defeated and stuffed, we both left half of our chips. Despite a few niggles, Bungalows and Bears’ burgers are delicious, and there’s enough variation to make return trips a necessity. However, considering the price of one burger (most clock in at around £8) I will definitely be returning – but only on 2-for-1 Tuesdays. This too-good-to-be-true offer turns a rather pricey burger into an absolute steal. So, visit on a Tuesday, save a few quid on the burgers, splash out on a bottle of Bungalows and Bears’ wine instead, and make an evening of it – because this is the sort of venue where you’ll want to take your time.